Booking (see the booking page) € 15,00 until 30/04/2018 and € 25,00 from 01/05/2018 to 12/05/2018. Mandatory medical examination, however, we suggest to participate well aware of their physical abilities and good footwear, supply of water and food, technical clothing (with rain jacket in the backpack). To under 18 years at 12/05/2018, the registration will be accepted only if accompanied by parent or guardian. 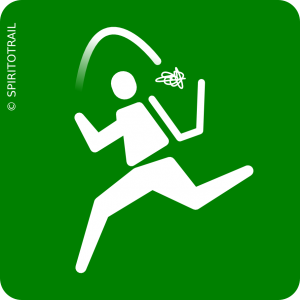 is a campaign promoted by the Spirito Trail and addressed to all true trailers , athletes and organizers , to protect the environment and nature . Too often during the races you see on the track waste left by the participants . Increased awareness will serve to make everyone understand that the trail runs can not ignore this simple rule : do not throw rubbish on the ground ! Please help spread this message to your races , with your website , your blog , or simply by word of mouth .